There is a disturbance in The Force. For Obi-Wan Kenobi in A New Hope, it’s the destruction of Alderaan. For the Emperor in The Empire Strikes Back, it’s the emergence of Luke Skywalker as a Jedi. In Revenge of the Sith, it’s Yoda sensing the mass slaughter of Jedi throughout the galaxy. In The Force Awakens, it’s Supreme Leader Snoke sensing Rey’s awakening and it’s Leia sensing Han’s death. While in Rogue One, it’s Chirrut Îmwe sensing Jyn Erso’s Kyber-Crystal necklace (and, I’d like to think it’s also Yoda, Obi-Wan – and the Jedi in Disney XD’s Star Wars Rebels – sensing the destruction of Jedha). What’s significant is that both Jedi and Sith (and force-sensitive people like Leia and Chirrut) sense that The Force has been “disturbed.” It’s also interesting that the force is disturbed and not troubled or agitated, or bothered or concerned. Seriously, why disturbed? What does this mean? As a practical matter, the quote just sounds better with the word disturbance – There is a troubling in the force? There is an agitation in the force? The force is bothered? Concerned, the force is? – none of them have the same ring. But with regard to meaning, it likely has to do with balance. Specifically, with The Force periodically experiencing an imbalance, like the emergence or extinguishing of (often significant) life. And both sides feel it. After all, The Force is supposed to be balanced, right? According to Star Wars creator George Lucas, The Force was finally balanced in the Star Wars narrative when Darth Vader killed the Emperor at the end of Return of the Jedi. This may have been what Lucas intended, but it doesn’t quite fit the larger narrative, especially as regards the Problem of Evil – the philosophical dilemma that seeks to understand why evil exists. There is no good answer that satisfies everyone. You either end up denying God or explaining evil as part of God’s plan or you cite Free Will and outline a compromise that accounts for evil (it’s a choice made by humans) and lets God retain his omnipotence (while dismissing or ignoring the issues of natural evil and pure evil). Either way, the problem and the paradox remain unsolved. 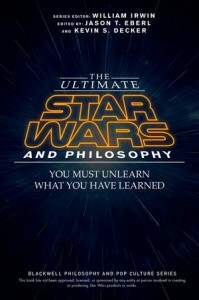 Of course, our goal isn’t to solve the paradox, it’s to see how it’s dramatized in the idea of The Force being balanced – and, it should be noted, that while the Jedi and Sith orders are considered to be religions in the Star Wars narrative (with all the strict dogma and codes and vows), there is never any mention of a Jedi “God” or Sith “God” in any of the theatrical films (not even Yoda or Darth Plagueis, for all their godlike power, are referred to as gods). And, to be fair, I don’t think George Lucas was trying to set up a pantheon of galactic gods in order to illustrate and debate the problem of evil. Still, it’s fun to ruminate, and given the nature of the Dark Side, it’s worth investigating how The Force balances things out with regard to the Problem of Evil. Consider how things play out in Episodes IV – VI. The Empire builds a Death Star and Luke blows it up. So, the Empire carbon freezes Han Solo (because that’s the narrative equivalent – I mean, it’s Harrison Ford). Luke and company return to blow up a second Death Star and party with Ewoks on the Forest Moon of Endor. This isn’t balanced because the good guys win (2 – 1). If we add the narrative outline of Episodes I – III: The Sith awaken and kill Qui-Gon Jin so Obi-Wan trains Anakin. Palpatine (aka Darth Sidious) seduces Anakin, who then kills all the Jedi. Obi-Wan and Yoda escape, as does Anakin’s newborn twins, Luke and Leia. Still not balanced because the bad guys win (2 – 1). It might be tempting to reason that with the bad guys winning in the first three episodes and the good guys claiming victory in the next three episodes (and a cumulative score of 3 – 3) there is a sense of balance. But this sense is an illusion because the balance didn’t hold. Anakin’s self-sacrifice may have defeated the Sith, but it also created The First Order and The Knights of Ren, embodied by Supreme Leader Snoke and Kylo Ren (and General Hux and Captain Phasma) in The Force Awakens. As we said earlier, balance is equality. The Star Wars narrative isn’t illustrating balance or equality, it’s illustrating revenge. Balance and equality aren’t about settling scores, they’re about win/win or lose/lose and this isn’t what happens in Star Wars – except in Rogue One (sort of). If Rogue One were truly a stand-alone film, there might be balance. The main protagonist (Jyn Erso) and the main antagonist (Orson Krennic) both die (lose/lose). If the story ended there, balance (like in Beowulf, hero and dragon kill each other). But it doesn’t end there. In fact, it’s just an extended prelude to Episode IV, with Jyn and Krennic passing the batons to Princess Leia and Darth Vader as the Death Star plans are transmitted. So, The Force is still imbalanced. The problem is that Star Wars is trying to do two contradictory things. On one hand, the narrative wants the heroes to win. On the other hand, the narrative wants The Force to be balanced – that’s what the prophecy of “The One” is all about. So, the problem of evil remains an unsolved paradox, one that gets further complicated when you try to account for the narrative structure of the monomyth – the protagonist vs. antagonist formula (also known as The Hero’s Journey) George Lucas borrowed from mythologist Joseph Campbell. As Campbell suggests, the monomyth (which in its fullest form has seventeen stages) is what nearly every story is essentially about: a reluctant hero accepts a call to adventure, passes through various thresholds, gathers a band of allies, overcomes a grand ordeal, and returns home with a prize, transformed and better off than when he started. Valerie Estelle Frankel, Maureen Murdock, and many others outline a slightly different narrative pattern for women called the heroine’s journey that essentially follows the same voyage and return/quest structure of the monomyth (and if we had time, we’d discuss how the women of Star Wars – from Padmé to Jyn to Leia to Rey – fit this model). Nevertheless, while these stages can be seen structuring most narratives (and creating many stereotypes, archetypes, and clichés in the process), the beauty of the monomyth is that there is an endless variety to how everything unfolds – hence, the title of Campbell’s book The Hero with a Thousand Faces. Thus, the monomyth is both a prescription for how to structure a story and a tool for how to analyze one, not just how the structure is employed, but what the structure might signify, especially as regards heroes and villains. Returning to Star Wars, the paradox we identified remains unsolved because the monomyth necessarily dictates that heroes should defeat villains, that good should triumph over evil. That’s why the Rebellion wins the seemingly decisive victories in Rogue One and in Episodes I, IV, VI, and VII) and probably will win again in Episode IX. This isn’t balanced, so The Force remains (and will always remain) disturbed. It’s going to be interesting to see how this plays out in the next two episode films or if the Han Solo film – which hopefully includes some Maz Kanata scenes – develops any Force-related mythology. The problem for Episodes VIII and IX isn’t answering the identity of Rey’s parents as many fan theories would have you believe – though, for the record, I believe Luke is her father and his tears in the last scene of The Force Awakens were for Rey’s mother, who was probably killed by Snoke (that’s why Maz tells Rey that the person she’s waiting for isn’t coming back). I also think Luke was standing at his wife’s grave when Rey found him (and the big “I am your father” moment in The Last Jedi will be “I killed your mother” – uttered by Luke because he feels responsible for her death). As fun as this is to speculate about, the bigger philosophical problem for the Star Wars saga is how The Force finally achieves balance. Perhaps the most logical (if not entirely dramatic) way would see Rey and Kylo Ren achieve a mutual peace to share the galaxy, allowing the Jedi and the Knights of Ren to coexist – a two-state solution or peace through mutual-assured destruction? (Will they sign a treaty, like Palpatine wanted?) This probably won’t happen, because the monomyth, Disney, and the history of the world maintain the good guys have to win, as do many of philosophy’s solutions to the problem of evil. Peace is negotiated with enemies (“That’s why it’s called making peace”), as George R.R. Martin observes in Game of Thrones and treaties are only signed, as history shows us, when one side surrenders. Maybe the real problem is that we can only see things in opposites and we can only define ourselves in relation to the mythical “other” because we can only think of ourselves as heroes – and this requires a villain, one that must be defeated (endlessly). Both sides do this, but perhaps if we can start seeing things as part of a greater whole (seeing the other side as our other half) we can begin to find the balance The Force seeks. Edwardo Pérez, Ph.D., is an Associate Professor in the Department of English at Tarrant County College Northeast. Campbell, Joseph. The Hero with a Thousand Faces. New World Library, 2008. Flesher, Andrew Michael. Moral Evil. Georgetown University Press, 2013. Frankel, Valerie Estelle. From Girl to Goddess. McFarland, 2010. Hume, David. Dialogues Concerning Natural Religion. Hackett Publishing, 2nd Edition, 1998. Murdock, Maureen. The Heroine’s Journey. Shambhala, 1990. “Star Wars Episode III: The Chosen One Featurette.” Youtube Video Clip, Sept. 10, 2010. Star Wars: Episodes I – VI. DVD, 20th Century Fox, 2013. Star Wars: The Force Awakens. DVD. Buena Vista Home Entertainment, 2016. Let me add another confusion to this. Lucas said in an interview that the Chosen One was to restore balance to the Force by ending the Sith. So balance can’t be equality between the Sith and the Jedi. 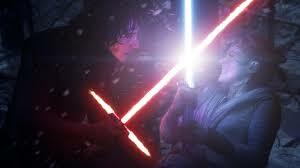 There is plenty of reason to think Lucas did see balance as being balance between the dark sides and the light sides. Just not between Jedi and Sith. The Sith were too effective at destroying the light side. Sidious prevented thousands of Jedi from sensing the presence of a Sith right in their midst. He was more powerful than the entire Jedi order, and he managed to take them all out. In the Legends canon, there is even an indication that the Sith, under Darth Plagueis, were actually doing damage to the Force by using the dark side in ways that were incompatible with balance, and Lucas signed off on all that. In the new canon, there are no Sith in the time of the First Order and Resistance, even though there are dark side users. If the Chosen One prophecy in restoring balance was about destroying the Sith, as Lucas has said, then it seems that did occur in the new canon. In the old canon, they kept coming back. But the Knights of Ren and Supreme Leader Snoke, while dark side users, are not Sith and presumably are not doing things that destroy the light side on the same level. It remains to be seen where the new movies are headed. It’s not clear that Lucas’ vision will be honored. But there is enough that is still canon to suggest that the balance in the Force that the Jedi speak of and the balance of the Force in the prophecy are are not the same thing. The Jedi seek balance of some sort, but it’s probably not between dark and light. They see the dark side as destroying the balance of the Force. Perhaps it has to do with balance between the Living Force and Unifying Force, as some have suggested. But it’s not clear in what remains canon. The prophecy itself, however, at least according to Lucas, was about balance between the dark side and the light side and was fulfilled by Vader destroying the Sith. Somehow ending the Sith did bring balance to the Force, according to Lucas. But it’s not clear at all to me what that amounts to. The balance of the Force as spoken of by the Jedi and the balance in the prophecy are the same thing. This should be self-evident. The balance the Jedi seek is between dark and light. The Jedi do not believe that the dark side destroys the balance of the Force by merely existing.